It was a historic day for Union Pacific’s steam program. After months of preparation, UP’s Big Boy No. 4014 returned to the national rail network in the early morning hours of Jan. 26, 2014, to the applause of the hundreds of rail fans on hand to experience the moment. 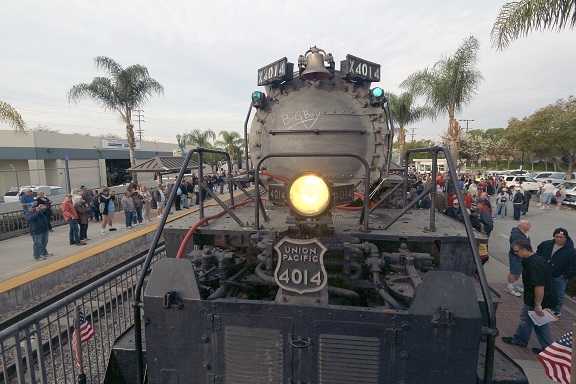 The mammoth steam locomotive departed its former home at the Los Angeles County Fairgrounds in Pomona, Calif., at around 1:45 a.m. Pacific Time, to begin its 56-mile trek on Metrolink and Union Pacific track to UP’s Colton, Calif., rail yard. The equipment used to move the mammoth locomotive included two diesel locomotives and 10 freight cars used for braking. As part of the operation, the train also delivered UP diesel locomotive No. 3105, a UP caboose and UP boxcar to RailGaints museum, where they will become part of the museum’s permanent display. Top speed during the move was 20 mph. Dickens said the operation was completed by 4:30 p.m. with the arrival of No. 4014 to Colton Yard, where it will remain over the coming months before its move to Cheyenne, which has yet to be scheduled. Dickens thanked the many who worked first-hand on the operation at UP’s Los Angeles Service Unit, including General Superintendent Rod Doerr, Regional Vice President Transportation Shane Keller, the folks at UP’s Harriman Dispatching Center and Metrolink. The public is invited to view Big Boy No. 4014 in Colton Yard Feb. 1-2 and 8-9 from 9 a.m. to 4 p.m. Colton rail yard is a busy ’round-the-clock operation. Because of safety concerns access is limited.